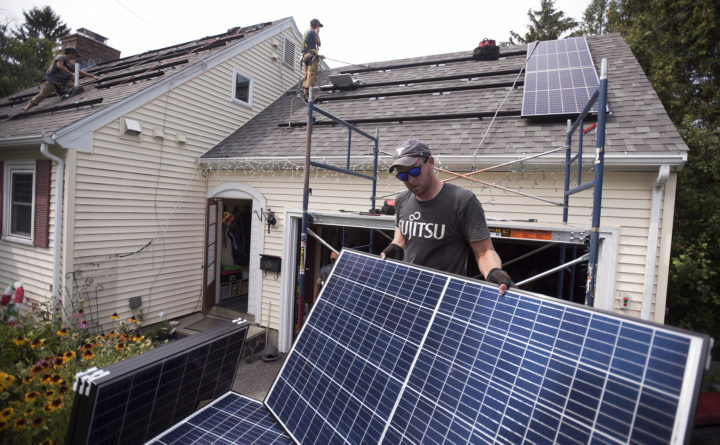 Dillon Fitts of Insource Renewables gets some of the solar panels ready as they were getting installed on Thane Fremouw and Clarissa Henry’s home in Orono. For the third time in two years, Gov. Paul LePage is pitting Republican lawmakers against the best interests of the state. If Republican lawmakers in the House of Representatives sustain his veto of common sense solar legislation, they will be responsible for raising electricity costs for all Maine ratepayers. This is a steep price to pay for political loyalty. Instead, the prudent thing to do is to override LePage’s veto of legislation that will not raise electric rates, while also ensuring the continued growth of an industry that is benefiting Maine and its environment. A strong majority in the House and Senate have already voted this way once. House Republicans shouldn’t be intimidated into changing their votes. The bill in question, an amended version of LD 1444, does two simple things. First, it negates complex and unneeded rules from the Public Utilities Commission. The PUC rules direct utilities to assess transmission and distribution fees on power generated by homeowners and others who generate electricity on their premises for their own use and sell the excess into the power grid. The fee will be charged on power that never leaves the home or business where it is generated, a huge windfall to electric utilities. The rules went into effect on March 16, but the PUC has already waived them for dozens of new solar installations in Maine. To calculate these new charges, new meters would need to be installed at every solar-generating location that sells power to the grid. These meters would measure the power generated, while existing meters would measure the amount of power used at these locations, including homes. Each meter costs $500 — a cost that would be spread among all utility ratepayers in Maine. The PUC rules does not take advantage of smart meters that already have been installed in Maine, at ratepayer expense. To collect such a charge, utility companies will have to update their billing systems and install new meters, which all ratepayers would have to pay for as part of their electric bills. Late in last year’s legislative session, lawmakers came close to fixing this ludicrous situation by overwhelmingly passing a bill that would have given the PUC until 2019 to come up with better rules for compensating residents and businesses that generate more solar energy than they need and sell it to the electricity grid, without requiring two meters. LePage vetoed the bill and, after heavy lobbying from CMP, several lawmakers who had voted in favor of the bill voted to sustain the veto. In 2016, the Legislature passed a bipartisan bill to update the state’s rules around solar power generation. LePage vetoed that legislation. When it came time for the override vote, many House Republicans reversed their earlier support for the legislation and voted to uphold LePage’s veto. Six lawmakers literally took a walk and did not vote on it, allowing LePage’s veto to stand. Republican lawmakers shouldn’t take this path again. In fact, the PUC found that all ratepayers are benefiting from the solar energy contributed to the grid by net metering customers. Another analysis found that the new charges would generate about $60,000 per year. The costs to capture that revenue would be about $3 million per year. That is a very bad tradeoff. The second thing LD 1444 would do is increase the number of entities that can participate in a community solar project from 10 to 50, well below the 200 CMP said was feasible. This will spur growth of community-based solar installation, such as on capped landfills. The legislation offers a much more prudent approach than raising costs for all Maine utilities customers because the governor objects to alternative energy. The Senate overrode LePage’s veto on Monday. The House should do so as well.